« Royal, Woolwich, The Arsenal, Arsenal – when, what, where, who? There are millions of stories about Arsenal that appear everywhere. But as we have already found on this site, sometimes those stories are just a little bit short of the truth. Here is another one. It is the story that says that Herbert Chapman changed the name of the club from The Arsenal to Arsenal, so that we would appear at the top of the list when the results were given out. I have put my name at the top of this article, but all the key information that allowed me to write it came from Andy Kelly, who has been and continues to be a terrific friend of this venture of charting Arsenal’s early history. I asked Andy to help me trace the name changes of Arsenal, from Royal Arsenal to Woolwich Arsenal, to The Arsenal, to Arsenal. The key was to find the right starting date for my proposed book on the Woolwich Arsenal story. Andy gave me all that – but within the data was this little nugget – Arsenal became Arsenal FC before Chapman was even mooted as manager. I will come back to the story of the change from Royal Arsenal to Woolwich Arsenal in the next article – but the Chapman story is bigger, so here it is first. Woolwich Arsenal Football and Athletic Club Limited became The Arsenal Football and Athletic Club Ltd in the summer of 1914 and a programme from 1913-14 (with the cover reproduced here) confirms that for the first season at Highbury we played as Woolwich Arsenal. A bit odd, but that’s how it was. Professional football then ceased for the duration, and Arsenal relieved their manager of his duties. But the club still existed and played some friendly matches, and at some point between 1915 and 1916 (when no league football was being played) Arsenal dropped “and Athletic” from their name. So The Arsenal Football Club Ltd was the name with which Arsenal entered the first division for the start of the first post-war season on August 30th, 1919, (coincidentally once again against Newcastle United – the opposition for the first game of Woolwich Arsenal in the league in 1893. We lost 0-1 at Highbury). But then, in November 1919 the name changed again and became Arsenal Football Club Limited. So could it be that such a well known story is wrong? If we look at the football programme web site [but beware this is a very slow loading site, so don’t try it unless you have fairly fast broadband] and scroll right down the page you will see two consecutive home programmes from the 1919/20 season – the one on the left from 22 November 1919 versus Notts County has the club name as “The Arsenal”, while the one on the right from 6 December versus Chelsea is the first time the club was simply known as “Arsenal”. In the next section you will see this commentary under a 1925 programme. 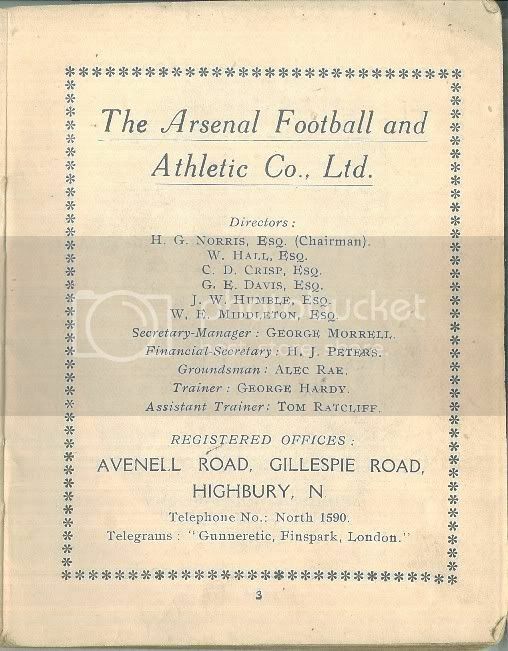 The 1925 programme for Chapman’s first match clearly states in big letters at the top “Arsenal Football Club Ltd”. So the documentary evidence is conclusive. The Arsenal became Arsenal Football Club in 1919, and changed the name on their programmes for the first time in December 1919. To coincide with the arrival of the famous new manager in 1925 Arsenal’s programme changed, but there is very little chance that Mr Chapman would have had anything to do with it. It looks much more like a marketing move by Sir Henry Norris. Herbert Chapman therefore clearly did not change the name of the club, as it says on the Arsenal official site, and as it repeated on tens of thousands of other sites and in other books. Apart from all the documentary evidence showing this is not the case, there is one other clear indicator – the vagueness of the date and process in the “Chapman changed the name” account. There should be something in Companies House, and there should be something changing in terms of the programme. But we do also have to take into account something else – and this will become even clearer in the next article which looks at the move from Royal Arsenal to Woolwich Arsenal and on. Clubs can have three names. First there is the name by which they are formally registered in the limited company records at Companies House. No one (apart maybe from Jacko Jones in Making the Arsenal) would ever have chanted, “Up the Woolwich Arsenal Football and Athletic Club Limited”. But that is what they were. Second there is the popular name of the club used by the club itself and sometimes even used by the Football League and FA. The name Royal Arsenal flittered around for several years after the club had become Woolwich Arsenal. Third there is the fans’ name and that used in the newspapers. I suspect that what might have happened was that Mr Chapman appealed to the fans and the media to ask them to stop using the name “The Arsenal”, pointing out that the club had been “Arsenal” for years. A PR move in an interview perhaps. I have zero evidence for that, but it is a possible origin of the story. However of one thing I think we can be clear. Herbert Chapman did not change the name of the club. Arsenal did not dominate English football during the 1930s. Wow Tony and Andy, I think you deserve a lot of credit for the work you are doing on this. I don’t have a hat like Tony has, but if I would have on, I would take if off and make a bow. 1.In the middle to late 30’s Arsenal DID dominate English football. Witness England v Italy 1934 when Arsenal provided no less than 7 players in the side. 2.My late Father, following Arsenal during WW1, (while convalescing in England after being wounded in Belgium,) always referred to The Arsenal all his life.